Author Marc Weitzmann is an award-winning journalist who has published ten books in France. He is a regular contributor to Le Monde’s literary supplement and Tablet Magazine. Before recent outbreaks of violence in France against Jews, before Charlie Hebdo and the Bataclan night club attacks, author Weitzmann noticed patterns emerging among these attacks against Jews in France. He sensed a relationship between apparently random “lone wolf” attacks by the general public and strategic, organized attacks by professionally trained terrorists, such as from ISIS or Al Qaeda. Yet those groups could hardly be similar. One supports open democracy, the other mandates Sharia law. The scope of earlier anti-Semitism in Europe, including the Nazi genocide of Jews in WWII is not addressed here. The author’s focus is concentrated on attacks in recent decades. Could these outbreaks of violence against Jews have presented a harbinger for even more murderous attacks against Jews elsewhere, including the Argentina Jewish Center attack and the Pittsburgh Tree of Life synagogue massacre? Are these orchestrated massacres against Jewish targets about to increase and in varied global locations? Can we use such data to predict future acts of terror against Jews? Are specific nations, such as Saudi Arabia, Iran, or Pakistan financially supporting the training of terrorists and acts of terror against Jews? And if they are employing a deliberate strategy to attack “soft” Jewish targets, can there be any safe place for Jews? 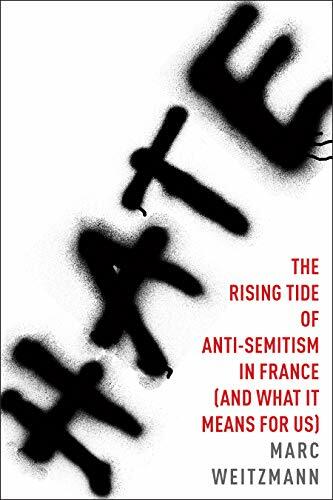 Weitzmann’s excellent book is a stellar focus upon the major influences producing an increase in anti-Semitism in France during the past 30 years. Thanks to the author’s careful research, Hate is more than an analysis of recent anti-Semitic attacks. It has become a signpost, signaling where terrorists might strike next. Weitzmann carefully examines the confluence of fluctuating political conditions in France, influenced significantly by widespread Muslim immigration, in addition to the rise of far right indigenous French political parties, such as the National Front. These disparate groups express similar anti-Semitic values and promise more such attacks in the future. The result has been not just an increase in overall French anti-Semitism, but repeated murderous attacks against “soft” Jewish targets, including a school near Toulouse, patrons at the Bataclan theater, a Brussels neighborhood shootout and the Charlie Hebdo massacre. The tragedy in Mumbai might similarly fit within this type of genocide, had the net been cast farther. The author demonstrates how countless French citizens, including populist/nationalistic natives and radicalized Muslim immigrants, accept and promote tired, old, discredited lies about Jews, such as those presented in the widely debunked Protocols of Zion, which they continue to feed their mendacious supporters. This unholy union of Jew-haters and Islamic radicals blame Jews throughout time as the source of all of civilization’s troubles, but fail to provide any empirical evidence. Still, many sociologists today believe that the public is only happy when they have people who behave differently to despise. That such deceitful groups can summon gullible haters to perform acts of terror against innocent Jewish families, or any other type of family, is a dangerous sign of catastrophes yet to occur and not just in France. The only solution is education. Weitzmann also makes clear his disdain for the political left in France and serves a warning to America about the danger in allowing an unfettered political left to align their values with Islamic extremists. It’s hard to say if more conservative Western nations would succumb to a surrender to politically embedded or celebrity liberals. Still, we have been fairly warned and served with notice that we should prepare for devastating attacks, especially against Jews. The only question will be how we respond. Muslim immigrants and far right French nationalists make for strange political bedfellows. They are disparate groups politically, socially and religiously. Here we find only one common feature: anti-Semitism. We see a commonality of purpose in which French nationalists and Muslim immigrants equally share in hatred of Jews and in promoting violent acts of punishment against Jews. Yet neither group can change present conditions because they represent a small fraction of French society. So they resort to attacking “soft” Jewish targets because it is their only viable method of attacking French influence and power. These disparate groups of French citizens hate all Jews because they have been taught to hate throughout their lives by anti-Semitic family members and friends—and they hate Jews as a product of astonishing ignorance, jealously and avarice. Ironically, nowhere within Jewish teaching do we find it advised to hate members of any other religion. France was a colonial power until the mid-20th century, controlling vast areas of the Middle East, the far East (Vietnam), and North Africa. Like most colonial powers, they were hated by the indigenous populations under their control. Weitzmann traces the actions of Muslim immigrants from French colonial nations like Gambia, Chad, Mali, Togo, Sudan, Gabon, Tunisia, Niger, Republic of Congo, and Cameroon as they assimilated politically into contemporary French society. Vast immigration from those lands has pulled France farther toward viewing Jews as a malignancy, rather than a social and economic resource. Weitzmann leaves us with significant research to perform and critical decisions to make. How can we use the results of this book to help nations defend themselves from anti-Semitic attacks by both Islamic extremists and by those within our own societies who hate for widely ignorant, nefarious, and improbable reasons? The author attempts to leverage his family’s experiences related to fighting anti-Semitism, with his general political and social research and useful interviews with key players. While a noble effort, it falls a little flat due to inadequate relevancy. The influence of the author’s family just did not appear highly germane. In terms of editing, this book would be enhanced with the addition of visual aids, including diagrams and links to relevant videos of anti-Semitic acts. Otherwise, the translation and editing appear quite solid. Nonfiction can almost always be enhanced in quality by the use of varied media. In this case, photos, maps, charts, drawings and news articles (or remnants) from events such as the Charlie Hebdo murders, the Bataclan Theater tragedy and the Toulouse shooting would bring facts to bear in a way that words and descriptions cannot. Is there a connection between the new wave of anti-Semitism in France and Europe to violence against Jews in general? Could they be part of a new wave of anti-Semitism with foreboding global results? Do American militia groups and right-wing citizens espouse the same anger, resentment, and commitment to achieve violence against Jews as did the French far right? These are the important questions for future consideration. Waves of terror and murder against Jews and Jewish families in France are examined carefully in this excellent book. The author’s research is spot on and relevant. His writing is swift, vital and enlightening. Jews are not safe in France and elsewhere today. Marc Weitzmann has given us a blueprint of dangerous religious hatred that harkens to the Holocaust, with a promise of terror yet to come.